Apparently doing the whole new years pork thing is good luck, no? Well this is the best of both worlds: not only are we eating pork, we’re eating all this color! It’s fun and fabulous. Not that I ever need an excuse to eat pork, BUT. If you tell me that eating it will give me good luck? I’ll probably house more than usual. I mean, I realize that I can justify pretty much anything, but pork and good luck is right up my alley. It fits right into my secret justification brain. If you’re also a pork-on-new-years type of pal, and in the case that you only know how to cook for 54 people and end up with tons of leftover pork every single time… you can make these alllll week: pulled pork pizza with aged cheddar and caramelized leeks! (um yes), pulled pork and beer cheese grilled cheese sandwiches! (duh), pulled pork chili! (uh huh), regular old pulled pork sandwiches or even pulled pork tacos. I’ve made a whole heck of a lot of tostadas in my blog life and I gotta say that this is probably my favorite. The pork, the crispy shell, the tangy cheese and the tiny chopped makeshift pico de gallo is just to die for. Maybe it’s because I am currently a bottomless pit and want to eat everything sight, but the flavor combo – while simple – is GOOD. Good, not God, which I accidentally just typed out. Though if there is a pork god… I would worship it. As a note, I make pulled pork a multitude of different ways: in the crockpot, in the oven or even on the stovetop (this is the ONLY way my mom makes it). You can use whatever pork you have on hand for this recipe! To make the tortillas, heat a large skillet over medium heat and add olive oil and butter. Add each tortilla and cook until golden and crisp on both sides, about 2 minutes per side. Remove the tortillas and set them on a paper towel to drain any excess oil and cool and crisp up slightly. In a bowl, toss the tomatoes, cilantro, onion, lime juice, salt and pepper. Assemble the tostadas by placing some pork on the tortilla, then covering it with cheese, shredded lettuce and the tomato mixture. Add a little more cheese on top. Serve! If someone made this for me for dinner, then it’s true love. Hopefully my daughter. How delicious. My husband is so picky about his pork but even he would totally love these. Mine won’t look as good as yours….but I can try!!!! I didn’t eat pork on New Year’s once and I will never ever make that mistake again. I’m being boring and just doing brats and sauerkraut this year, but these look awesome! Pork rules baby! These look killer amazing. Pinned! I don’t really need any reason to eat pulled pork, because I am SO in lurve with it, but if you say it’ll bring good luck then mega win! You definitely did make us dinner because these look ah-may-zing! Pinned! Jess, I don’t even eat pork but you have got me thinking about these tostadas and nothing else now! Gorgeous photos! If pork brings good luck into the new year then count me in. This is such a festive, colorful presentation of the pork. BTW. . .thanks for all the creative ideas on what to do with the leftovers. With a household of two it’s no fun eating the same thing 4 days in a row. Even if pork brought bad luck, I would probably still eat it by the bucket full. These tostadas look amazing! Love! Happy New Year, Jessica! Every year my family has some kind of pork, roast, cracked or braise; Pork has to be served! Amazing and fresh flavours Jessica. Love it! Scots tradition is beef on new year’s but I’m pinning this recipe to try in January! I feel the EXACT way about pulled pork – acceptable on everything! My personal fav is salad, which means it’s healthy! So nice to see so much color in the winter months! 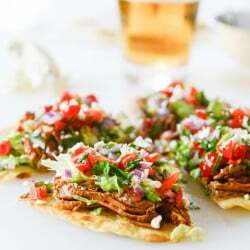 Never made tostadas, but this post has me thinking that I need to make them ASAP!! do you ever use a pressure cooker for pulled pork? baby Max posts > pork. I want to see and hear more about that sweet squishy baby! Drooling! Making this tomorrow night for sure! Anything with pulled pork wins. I’m all over thissss. I have never made tostadas before and that is definitely something that needs to change ASAP. These look incredible! So much colour! I love it! Spectacular. Love the colors, too. Yum! Yuuuuuum! I’m planning on making pork for NYE too! Definitely going to switch up and add pork to our New Year menu this year! I mean how bad can a year be if it starts delicious? Make sure you’re a good Pittsburgh girl and get in your pork AND saurkraut for good luck in 2015! What a beautiful baby!! What a very Merry Christmas for all of you, Happy New Year!! Yum!! The colors are fantastic and the good luck is just an added bonus. This recipe looks fantastic. Enjoy the New Year! I made these this week and they were fantastic! I made the pork a day before and it was such an easy dinner!! I made these tonight with the vanilla-bourbon barbecue sauce (side note: LOVE) from your book and the linked pulled pork recipe. I made a few adjustments…I used pork tenderloin instead of pork shoulder (and cooked it in the slow cooker) and used goat cheese as I could not find queso fresco, BUT, it was amazing. I loved the bit of spice it had. I will definitely be making these again!